Are you trying to replace your old shopping habits at Walmart, Tesco or Carrefour, and searching for that one large out of town supermarket in Frankfurt? Well the place you are looking for is Real in Eschborn. 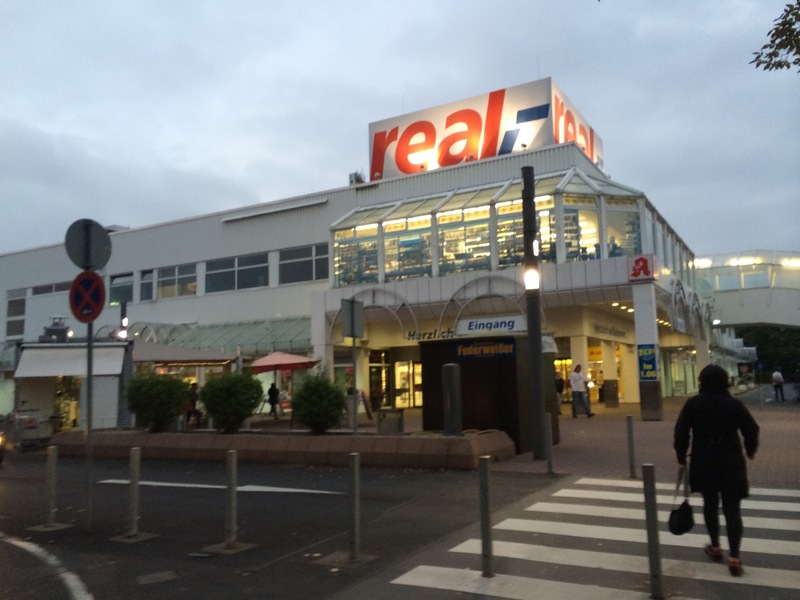 Unlike the UK, where the supermarket chains all have small innercity branches and then one big store on the ringroad, in Frankfurt the REWE stores that you see everywhere are as big as it gets. I spent ages trying to find a big REWE and there isn’t one. To get to Real, you’ll need to have a car. The good thing is that it is easily accessible by autobahn, just north of the city, and is open until 10pm Mon-Sat. They also have relatively cheap petrol and you can check the price online before you go. You should also sign up immediately for the Payback loyalty card as well. You can use it at lots of places, but you’ll need to print the temporary one first, as you won’t get a real card until you start collecting points. Hi! Great blog! 🙂 Afaik they are three big REWE stores within Frankfurt, called “REWE Center”. The biggest one is located in the Nordwestzentrum mall (in the north, on the U1 subway) with a three-storey outlet. Smaller versions can be found in the Hessen-Center mall (in the east, U7) and in the Griesheim district in the west, near the Jägerallee stop of the 11 and 21 trams. They are not as massive as the Real in Eschborn though – the Nordwestzentrum one coming closest.